Where do I find my Venuemob enquiries and booking requests? Enquiries are the first point of contact from customers interested in booking your venue for an event. Every time a customer sends an enquiry to your venue, you'll receive an email notification. You'll also see it appear in your activity feed, and in the Enquiries section of Venuemob Manager. Enquiries are sorted by date by default. From this overview, you can see the name of the customer, the event type, date, capacity, budget, the staff member the enquiry is assigned to, the status of the enquiry and tasks required. The status of the enquiry and the assigned staff member can be changed from this view. Please note: it's important you change the status of an enquiry to booked or not booked before the event date passes. Click on the enquiry to see any messages sent by the customer, and to respond. NOTE: If you manage multiple venues under the one account – enquiries are sorted by venue. When you're looking at Venuemob Manager for Venue A, you'll only be able to see Venue A's enquiries in the Enquiry view. 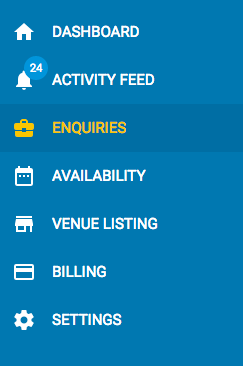 To see Venue B's enquiries, head to the drop down menu in the top toolbar and select Venue B from the dropdown.